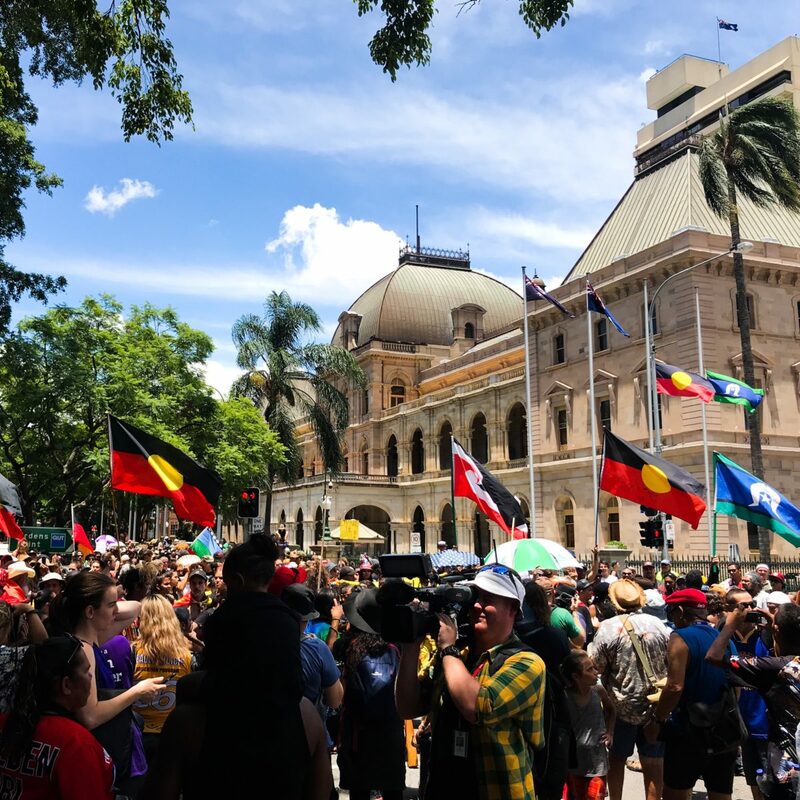 Getting ready to post pics of today’s Meanjin Invasion Day March, and I notice in this one that the Aboriginal and Torres Strait Islander flags were at half-mast. I didn’t see this at the time, only when I was editing the image. Both the activist and the insider play different but equally important roles. The activist (artists, writers, etc) stretches our imaginations of the (im)possible. They spend their energy pushing us in directions we as a community and society dare not every dream of. But the insider (the teacher in a school, the health worker in a big hospital, the public servant in a bureaucracy), they too can take on an activist role. Over the years I’ve met many staunch Aboriginal and Torres Strait Islander people who have continued to work on the inside, who have pushed the boundaries of how the system works. I know many of them, we’ve had long conversations in their necessary de-briefs about the difficulties of their work – their frustrations and struggles. They take on the role of “being the one”, often in places where there is an aversion to risk (hello Queensland!) and a lack of personal accountability from non-Indigenous peers. When I thought about the flags at half mast, as I said, I imagined some poor soul working within government who said “let’s do this”. He or she said, let’s be human and recognise that while we can’t officially acknowledge Invasion Day (OMG! Can you imagine the legal and protocol officers going nuts about how this would be done? ), let’s just take one small step that acknowledges the humanity (the good, the bad and the ugly) of this country. It is a small but significant step. But to get this approved would have taken all manner of internal negotiations and compromises I can only just begin to imagine. In this instance, it’s easier to be the activist, jump the fence, work the ropes, get arrested and spend the night in jail (stressful, but on the whole easier). To be the insider means to continuously negotiate non-Indigenous people and the system, and “work it”. After I found myself on this train of thought (helped along thanks to a post-Deadly Runners conversation with Professor Sandy O’Sullivan), I spent an hour or so reading some theory about bureaucracies and power. I’m interested in this notion of bureacracies causing / requiring (?) deindividualisation. I think this is a concept I’ve been working through in my head over the past few years – just without the name. I need to keep reading about this. Both the activist and the insider are vital in the work of seeking / demanding justice and implementing change on a micro and macro scale. I don’t believe I’m either – activist or insider, or maybe I’m both, or maybe one or the other at different times. Either way, I think it’s important that we reflect on these differing roles, and respect the roles that each play in moving us forward. Huge hats off to all those souls doing the daily grind in the systems, as well as to those who work on the fringes getting us to imagine a better side to ourselves.